Located in the Main Store Mall. Enter through main entrance and take a left. Go past Starbuck. Barber Shop is on the left across from the Optical Shop. 9230 7th & B St.
Tim Horton's, Cold Stone Creamery and the Great Steak are all located in the same building. Full service Cox Communications Kiosk. Able to accept payments. We can frame all your special memories. We also customize Shadow boxes. Laser Engraving service available with quck turnaround. Special gift items and artwork. Located inside the Main Store Mall. Go left past the Starbucks. Kiosk is located outside the Salon & Spa. Custom Embroidery offers nametape services as well as civilian items with thousands of design and font options. Our experienced and creative staff is on site to assist you with all of your military and non-military needs. Located inside Main Store Mall. Located in Food Court of Main Store Mall. Located in the Main Store Mall next to Things Remembered and the Custom Frame Shop. We Deliver. Our experienced staff provided custom arrangements and designs for all occassions and budgets. Wide variety of plush, giftware, vases, ballons, candy, cakes and more. Unmanned. Pay at the Pump. Located instide the Main Store Mall. 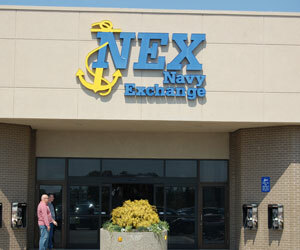 Located in the Navy Exchange Norfolk next to Barber Shop. Offering discounted tickets to local area attractions. Going towards the Pier on Gilbert Street, on the right immediatly past Piersey Street. No attendant on site. Open Holidays from 1000 - 2000. Through Gate 5 on Right (in same bldg. as Fitness Center). No Attendant on facility - May contact (757) 464-9505 from 8am-4pm Monday thru Friday. Shares space in the Q80 Fitness Center at the Piers. No attendant on Duty. Contact (757) 464-9505 Mon - Fri 0800 - 1600. Located in the main store mall. Go through main entance and take a left - Located on your left past Starbucks, across from the Optical Shop. Full service Salon and Spa. Nail technician - acrylic, gel, natural, hand painted art, manicures, pedicures, waxing, facials. Call to schedule your appointment today. Enter NEX Norfolk Mall throught main doors. Starbucks is on the left. Located in the main Norfolk Exchange - Mall Drive. Services Corridor next to the Optometrist's Office / Family Optometry. We can fill many single vision prescriptions in one hour. Large selection of designer frames available as well as entry level frames starting at $39.99.